There has been a building of some sort were Speke hall now stands for at least 600 years, with parts of the last structure being incorporated into the hall. The first part of the hall to be built was the Great Hall which was completed in 1530, with the Oak Parlour wing being added a year later. Speke Hall is one of the most famous half timber frame homes in Britain, due to its age and the relatively good condition it still stands in. Also the only major additions to the house were all done at its initial construction, with the south and west wing being built in the 1540's. The last major addition was the north range which was built in 1598 by a man named Edward Norris, after this the hall has had no more construction done to it, with only smaller changes and restoration done. The house was owned by the Norris family for several hundred years until the last female heiress married into the Beauclerk family who sold the house to the Watt family in 1795. It was the Watts who had the grounds landscaped and so creating the gardens during the 1850's. Interestingly there are two Yew trees in the courtyard of the main building called Adam and Eve, both of which are estimated to be over 500 years old. The house was passed from the Watt family to the national trust in the year of 1942 and the it is still owned and managed by the trust to this day who have the hall and gardens open to the public as a tourist attraction. If you wish to visit please check with the venue directly though to ensure the correct seasonal opening times. 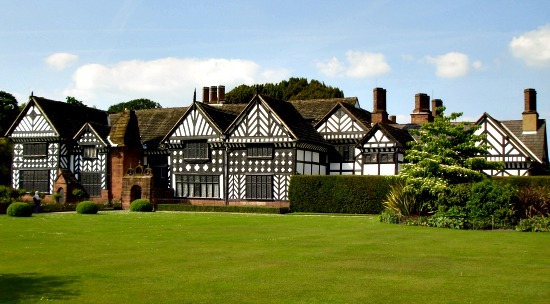 There are thought to be several ghosts who choose to linger at Speke hall and it has been investigated many times by various ghost hunting groups, including that of the UK's most well known ghost hunting show "Most Haunted". The hauntings at the hall are a little different from the typical mansion style hauntings, as whoever lingers here chooses to make their energy known through feelings as opposed to the direct sighting of an apparition. The hall has a priest hole, which was a hiding place for priests when the priest hunters of Queen Elizabeth I came to persecute Catholics, and an eaves hole in the waiting lobby of the building. One can only imagine the terror felt from a hiding priest when a group of armed guards were searching through the house to find one to murder. Perhaps it is these extreme sense of terror and sickness from fear which have "stained" the house. Unexplainable and intense feelings of sadness and nausea have been felt through out the building by many visitors, with hot spots being in the rooms closets to the priest hole. The great hall is also another area of the building were the paranormal activity seems to be concentrated. Shadows in the shape of people have been seen floating around the walls and across the ceiling, and an overwhelming sense of oppression often accompanies them. The blue room is also considered to be rather haunted, with a dark mist like figure being seen in the room on an almost common basis. EVP taken from within this room has often relieved the words "get out" though they can only be heard from the recording and never in person. It is the tapestry room which holds the most disturbing story and the most active ghost. The spirit who lingers here is thought to be that of Mary Norris who in a moment of intense distress managed to throw her young son out of the window into the moat. Realizing what she had done she jumped out herself and joined her son in his watery grave. Since that day there have been reports of seeing her ghost within the room, either gliding across as if she were floating or just standing still, staring out the window before fading away after a few seconds. The story of Mary cannot be verified and is rather unlikely, but this is the story most often associated with the spirit in the tapestry room.